WHAT IN THE WORLD IS GOING ON IN THIS PICTURE? A. 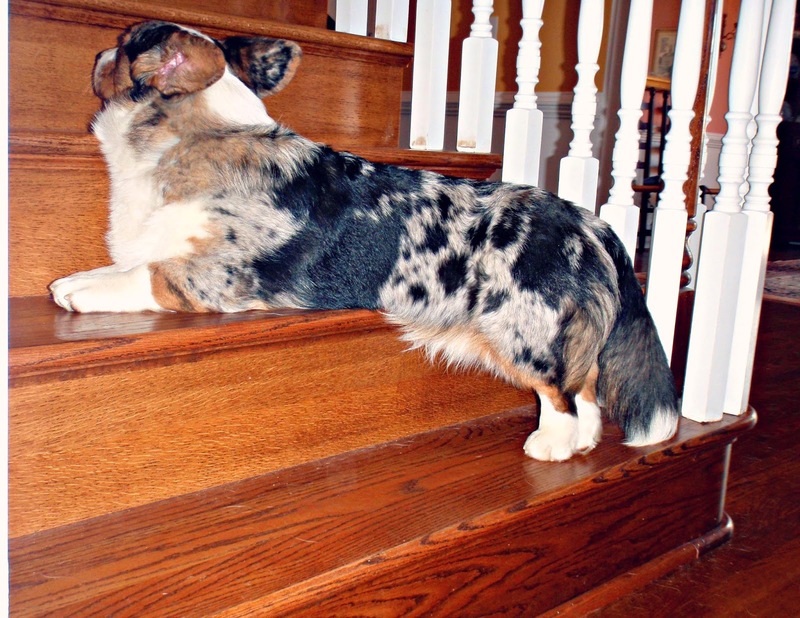 "Step on it, Bucky, it's a starving CORGILOPE!" 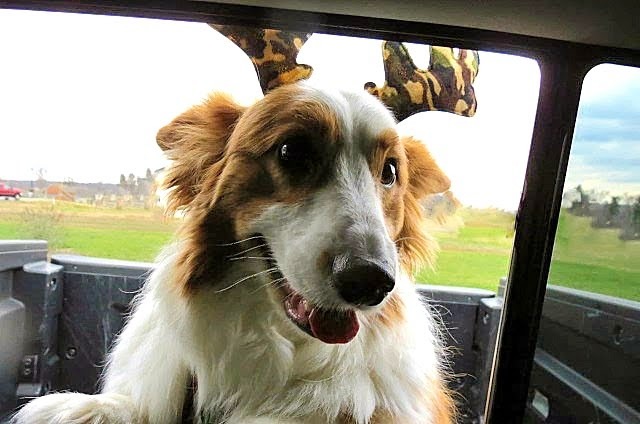 B. Jon Farleigh is in the truck bed wearing camo antlers for a Christmas card photo shoot. D. It's Jon Deer. Duh. Leave you best guess in comments or on the Facebook page! C. He was stranded there on the 2nd step, afraid of slipping off in either direction, and was resting. Important note: This was the first time Dewi ever attempted to go up those steps (years ago). He made it up ONE step before he quit and then just parked there for 10 min, until I realized he wasn't underfoot and found him there. He and Jon Farleigh can climb stairs now (can't get back down them, but that's another blog post); however, they are NOT allowed to go upstairs in our house, and therefore, do not use these stairs. Not ever. So, NO fretting. Oh no, poor guy! We put a rug on our stairs. Or you could try ToeGrips. No rug, but the toe grips would probably be a good idea for the mini humans. Thankfully, my room is downstairs and so the dogs have been trained not to get on the stairs (and the kids have been trained not to tempt dogs upstairs). Works out well, actually, because the upstairs can serve as a no-dog-zone for the kitties. Corgilope. I will never get over that. Ever. But just now while trying I realized I missed #cardicomedy AGAIN. I should be put out to pasture with the corgilopes. Well, considering I didn't show up for #cardicomedy either(well, until I canceled it 25 min late), I'm not sure I should even be allowed to graze. :) Also, corgilopes are real. Just really elusive. D Jon Deer LOL. Wow no stairs. Lucky you, Have a marvellous Monday. D. Jon Deer. I almost thought it was the Christmas photos, but then realized antlers were wrong and it's Springy Jon Deer GREEN out there. A corgilope. Too funny. I used to have a flying jackalope t-shirt - ahhh, memories. (Yes, I was fashionable.) But I'm gonna go with C.
The story about the stairs is too cute! My husband had some jackalope stuff. His college roommate was from TX and was a real card. It's a Corgilope! Love the new header on your blog. Very retro cool.